Whenever we go to North Carolina, we consider a trip to the Outer Banks, or as the locals refer to it, “OBX.” There is so much to see there; Kitty Hawk & Kill Devil Hill – site of the Wright Brothers’ first flight; the Lost Colony of Roanoke Island; Jockey’s Ridge State Park – some of the best kite flying anywhere; Cape Hatteras Lighthouse; Ocracoke Island; and, of course, the Atlantic Ocean! 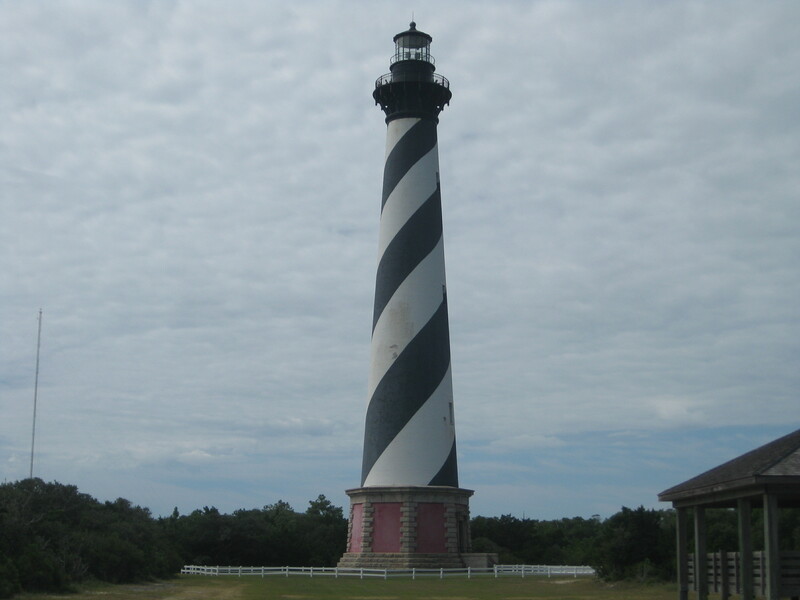 The Cape Hatteras National Seashore stretches north to south across three islands, Bodie, Hatteras, and Ocracoke. 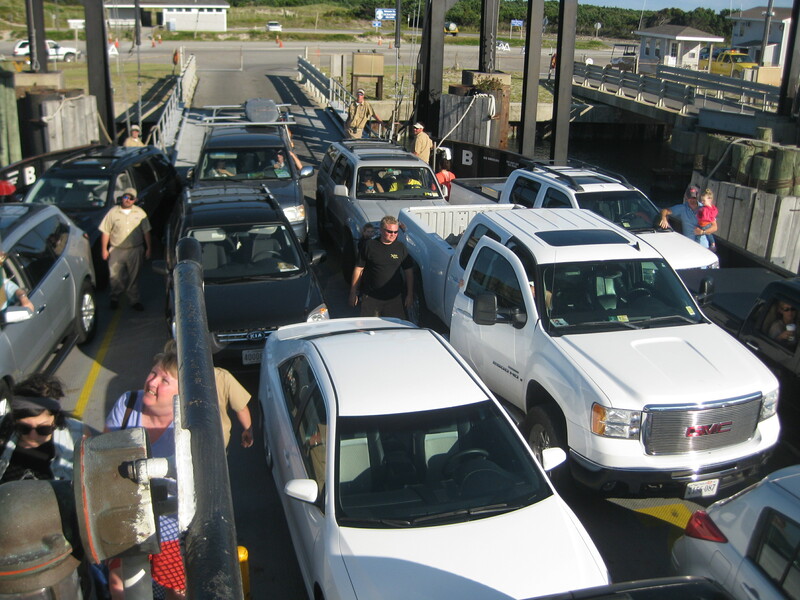 NC Hwy 12, a narrow paved road and the Hatteras ferry link the islands. The highway runs through eight villages that reflect the nearly 300 years history of the Outer Banks. 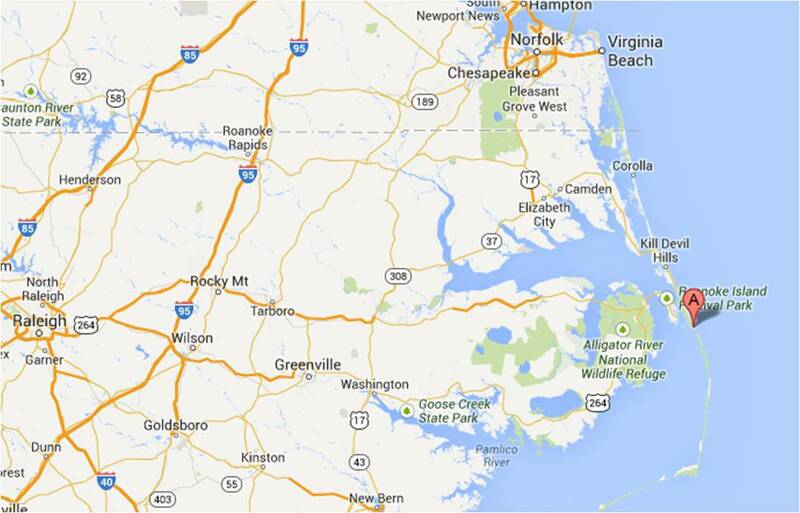 The Outer Banks serve as a chain of barrier islands, protecting Albemarle and Pamlico Sounds. There are four National Park Service campgrounds, only the one on Ocracoke Island takes reservation, the rest are first come, first served. We stayed at the Oregon Inlet Campground on Bodie Island. Oregon Inlet does not offer any utility hookups, but fresh water and a dump station are right across the road at the Oregon Inlet Fishing Center at no charge. At Oregon Inlet you are only a short walk over the sand dunes to the ocean. 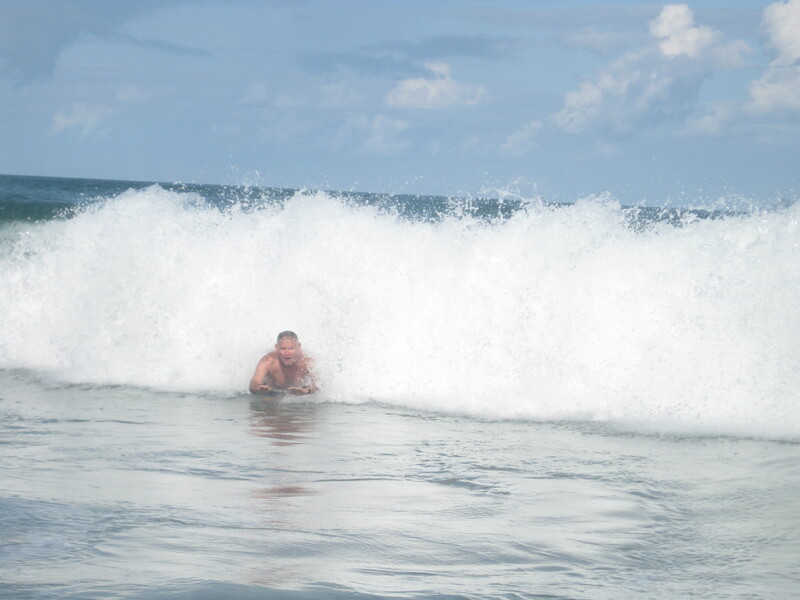 When the surf is up it is great fun to play in the large waves and body surf back to the beach. 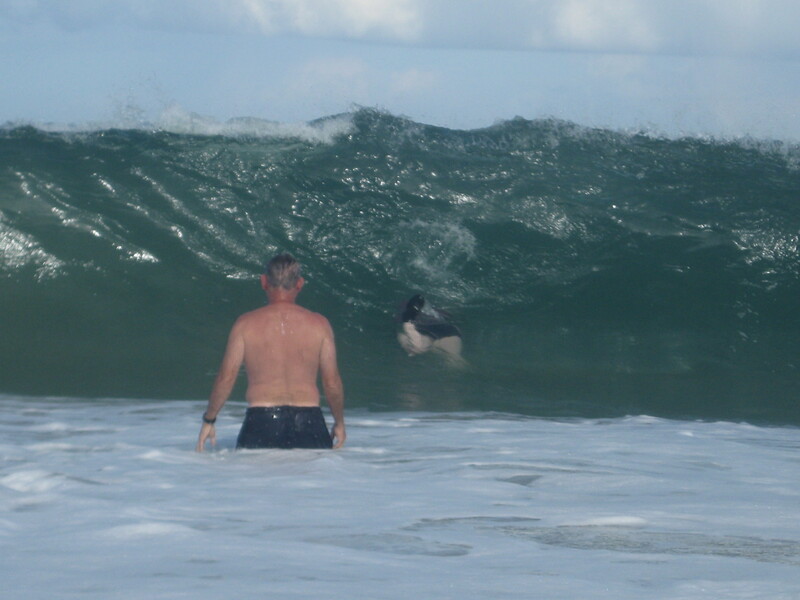 Our daughter, Elisabeth and I had a great time and a trip to the beach was a regular event on our schedule. The Cape Hatteras area was and remains a hazardous passage for shipping, which is why the area is known as “The Graveyard of the Atlantic.” Over the years Congress authorized the construction of a series of lighthouses and lightships to warn mariners of shoals, reefs and other navigational hazards. 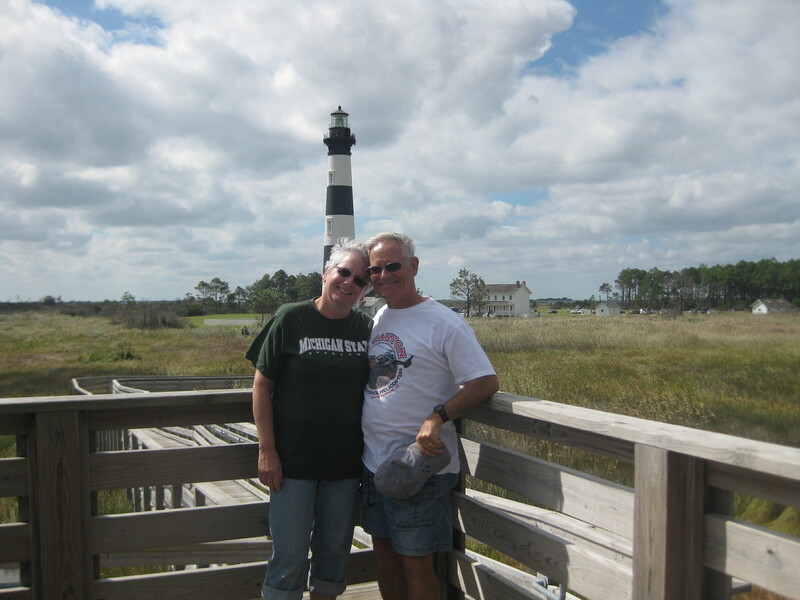 Our first outing was to visit the Cape Hatteras Light. The Cape Hatteras Lighthouse protects one of the most hazardous sections of the Atlantic Coast. Offshore of Cape Hatteras, the Gulf Stream collides with the Virginia Drift, a branch of the Labrador Current from Canada. This current forces southbound ships into a dangerous twelve-mile long sandbar called Diamond Shoals. Hundreds and possibly thousands of shipwrecks in this area have given it its dangerous reputation. The current lighthouse was lit on December 1, 1870. From the 1960s to the 1980s, efforts were made to stabilize the beach in front of the lighthouse, which had started to erode again. In March of 1980, a winter storm swept away the remains of the 1803 lighthouse and caused significant dune erosion. In 1999, after years of study and debate, the Cape Hatteras Light Station was moved to its present location. The lighthouse was moved 2,900 feet in 23 days and now lies 1,500 feet from the seashore, its original distance from the sea. The Double Keepers’ Quarters, the Principal Keeper’s Quarters, the dwelling cisterns, and the oil house were all relocated with the lighthouse. 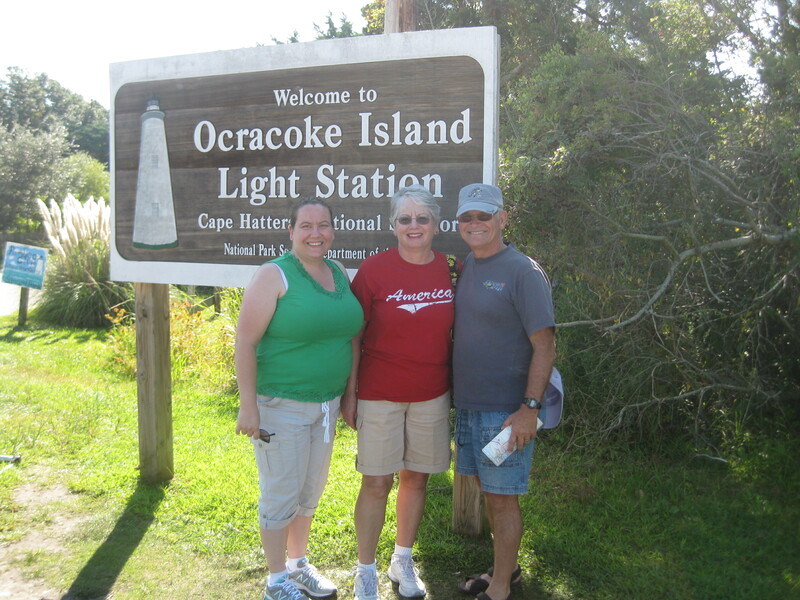 From there we drove to Ocracoke Island at the south end of the National Seashore. Ocracoke is a small island and jam-packed with visitors. We took the free ferry from Hatteras Island, parked near the National Park Service Visitor Center, and walked around town. It is said that the pirate, Blackbeard, roamed the nearby waters and established a base on Ocracoke Island. His ship, the Queen Anne’s Revenge, is sunk offshore. The Ocracoke Light is the second oldest operating lighthouse in the nation. 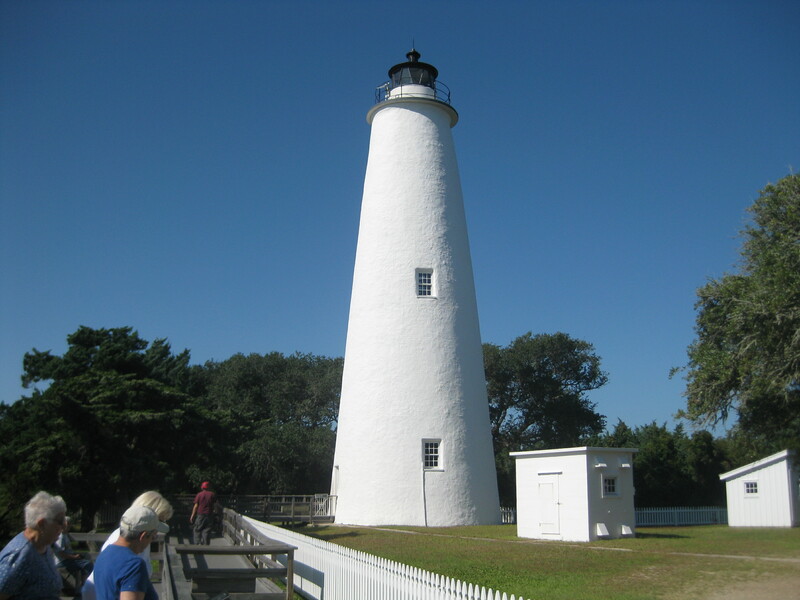 In 1822, for a charge of $50, the federal government purchased two acres at the south end of Ocracoke Island as the site for the new lighthouse. Constructed by Massachusetts builder Noah Porter and finished in 1823, the tower still stands today. Total cost, including the one story, one bedroom keeper’s house, was $11,359, far below the $20,000 budgeted. Wouldn’t it be nice if all government contracts were like this one? Ocracoke has a small local museum that was full of local history and the staff added more details to the exhibits. It’s surprising what a small community can do if it puts in the effort. Elisabeth and I went kayaking in the Pea Island National Wildlife Refuge. 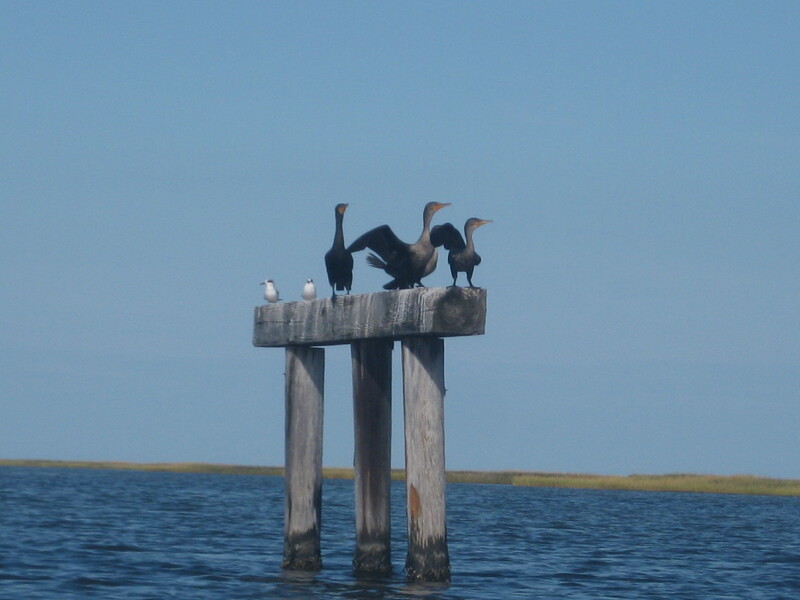 The Pamlico Sound is a great kayaking location, it is calm, protected by Hatteras Island, and there is abundant wildlife above and below the surface of the water. The amount of pelicans, cranes, ibis, and seagulls is amazing and they are everywhere. We had fun paddling down the small canals in the area, although we ended up in dead end channels more than once. The Bodie Island Light was closest to our campground. This light was closed to the public for many years due to the amount of deterioration. After years of raising funds and postponement, work to restore the cast iron and other parts in need of work began on the lighthouse in August 2009. As of March 2010, the outside scaffolding was 100% complete while interior scaffolding was 50% completed. The restoration was stopped in spring 2011 after significant new structural integrity issues were found in many of the main support beams under the balcony. The additional repairs needed were too costly to finish in the original restoration project. Additional funding was obtained to continue the restoration, which was restarted in 2012 and completed in March 2013. There was a re-lighting ceremony on April 18, 2013, and the lighthouse was opened for the general public to climb the following day. After Elisabeth headed back to Raleigh, Pat and I went kayaking in the Oregon Inlet. This is a great local fishing spot and there are many channels to kayak through. 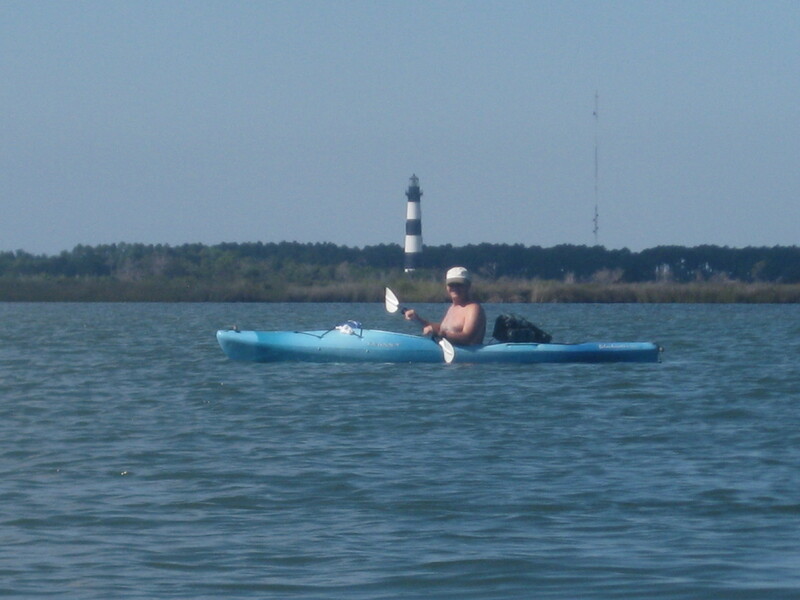 The Roanoke Sound is a pleasant kayaking experience in the shadow of the Bodie Island Light. The National Seashore is a unique mixture of science, history, and nature. There is more than one reason we continue to return to the Outer Banks. However, all good things come to an end and we headed to Raleigh on September 26th. This entry was posted in Fulltime RV, Michigan Traveler, National Parks, North Carolina and tagged Blackbeard, Bodie Island, Cape Hatteras, full-time RV, fulltime RV, Graveyard of the Atlantic, Jockey's Ridge State Park, Kayaking, Ocracoke Island, Orgon Inlet, RV Forums, Wright Brothers. Bookmark the permalink.